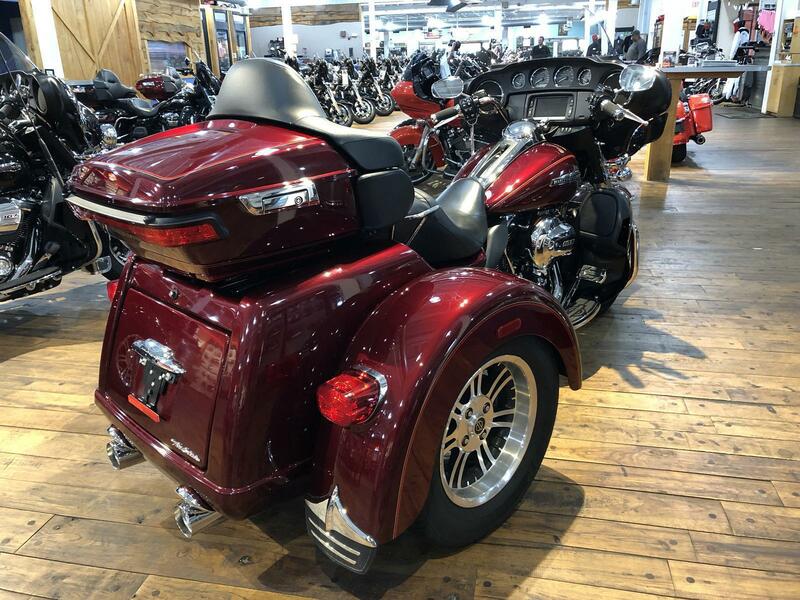 There’s more than an added wheel at work here: The Tri Glide® Ultra model is everything you love about the Harley-Davidson® touring tradition, only more. You get every Project RUSHMORE feature and improvement applied to our three-wheel frame design. You also get the confidence of front to rear linked brakes. It all adds up to better miles and more comfort than a vibrating motel room mattress. Get into the middle of nowhere on this one and you won’t be coming back anytime soon. Project RUSHMORE - Engine: As every rider knows, the engine is at the heart of the experience of riding a motorcycle. The amount of torque and horsepower it delivers over the RPM range is in direct proportion to the feeling it gives you when you roll on the throttle. We know what riders want from a motorcycle engine because we’ve been building them for 110 years. Project RUSHMORE gave us the opportunity to dial it in just right. We conducted thousands of road tests with real riders giving us feedback to build the next iteration of the legendary Harley-Davidson® engine. The consensus was: We want more. More low-end torque, more passing power, more perfection in the tone of the exhaust note, more of the feeling we ride a motorcycle for. So we built the engines that deliver it. We’re proud to unveil the next level of Harley-Davidson® V-Twin engine. And prove once and for all, the customer is always right. Dual Disc Front and Rear Brakes: We've installed the ultimate complement to the reliable dual-disc front brakes. The top-of-the-line dual-disc assembly in back comes complete with hand-actuated parking brake. So whether you're descending a mountain of switchbacks or just trying to park in San Francisco, you can ease your mind. Ergonomically Designed Hand Controls: It’s hard to enjoy the ride or keep your eyes focused on what’s coming down the road when you’re fussing and bothering with the switches on your handlebar. So we’ve worked over the hand controls on our trikes with as much passion as we’ve worked over our engine. We made the shape more ergonomic and located and angled them to fall right under your thumbs. We’ve added left-hand cruise for easy activation, toggle switches to control infotainment functions, and an easily locatable trigger switch to control and scan through functional readouts. And we’ve improved the feel to give you a confidence-inspiring click at every push of a button. Even the dash panel switch gets better. And it’s all prewired for parts and accessories, which even lets you customize with less fuss and bother. 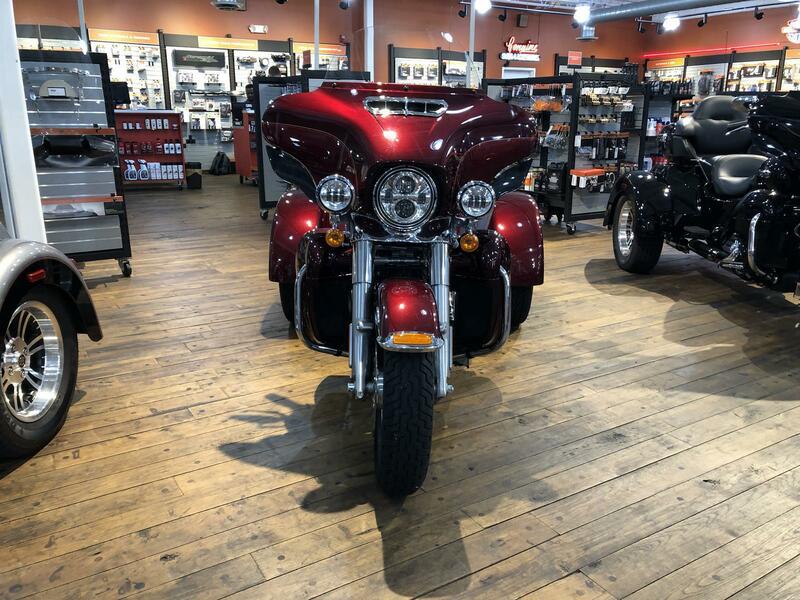 Project RUSHMORE - Control: Here are some of the innovations Project RUSHMORE led to: Daymaker™ LED headlamps and fog lamps, brighter turn signals, brighter brake lights, and a steering head with stiffer front forks. We’ve made it feel even better to lean your way through a turn. Now you can see better. And we’ve made you more conspicuous to the cage-driving public. Because one thing we all agree on is this: bikes that work better make riders who ride better. Take a ride. See how good you can be. Twin-Cooled™ High Output Twin Cam 103™ Engine: If you started in 1909 with the very first Harley-Davidson® V-Twin engine and worked your way up through every engine, every innovation, every improvement, every ride, every durability test in all those years and countless miles since, you arrive at the Twin Cooled™ High Output Twin Cam 103™ engine. This is the top of the line. 103 cubic inches of air and precision cooled Harley-Davidson® V-twin engine power. Twin cooling cools the heads around the exhaust ports to deliver at or near peak performance under all operating conditions and temperatures. A higher compression ratio increases efficiency and horsepower. The airbox delivers increased airflow and the cams optimize low-end torque. It’s got the fastest 60 to 80 mph 5th gear roll on in the history of Harley-Davidson. Which means it’s got the most passing power in the history of Harley-Davidson. On top of all that, it puts less heat on the rider and passenger on scorching days and in stop-and-go traffic. Tour-Pak® Design: The Tour-Pak® luggage carrier sports a sleek look, but it didn’t come at the expense of storage space. They’re bigger inside than ever and can easily accommodate two full face helmets. There’s a document and toolkit pouch. The lock is integrated into the latch to keep your key away from your premium paint. And the premium hinges work better and look sharper. You can operate the single latch with one hand. Storage. Check. We have it covered. Trunk and King Tour-Pak® Storage: With a total cargo capacity of 6.7 cubic feet and up to 80 pounds, the Tri Glide® Ultra model puts the "haul" in long haul. The integrated trunk offers 4.4 cubic feet and 50 pounds of storage capacity, while the waterproof, injection-molded Tour-Pak® luggage carrier keeps things classy and neat with soft woven-nylon luggage liner and plenty of storage pockets. So head out cross country or to Biketoberfest knowing you've got the capacity to turn luxury touring into luxury living on the road. 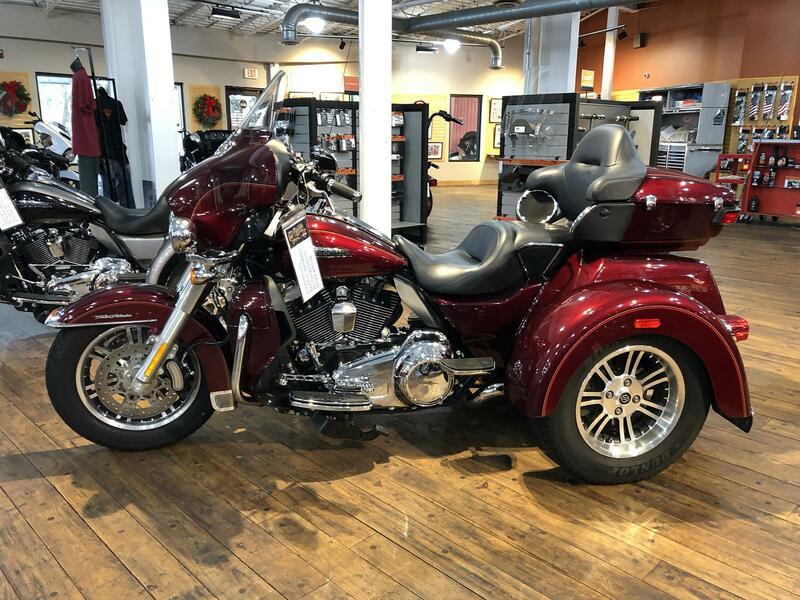 Standard Cruise Control: Installing cruise control is standard operating procedure on the trike models because riding long stretches of unbroken highway is standard operating procedure among touring riders. Electronic throttle control means no cable cluttering up your handlebar. And the switches are placed where you can easily dial in your speed with your left thumb, give the wrist a break, and keep hauling on down the road. Project RUSHMORE - Convenience: If you want the ride to be truly epic, you have to sweat bullets to make the little things work exactly right. This is what Project RUSHMORE was all about. Now you have saddlebags and Tour-Pak® luggage carriers that can be easily opened with one hand. Compartments that open with one touch. And we’ve increased the storage space on these machines without ruining the sleek, road-eating look of the bike. It all adds up to hundreds of little moments where things just click conveniently into place. Because there can be no imperfections in the quest for the perfect ride. Pure Harley-Davidson Styling: Feast your eyes on the Twin-Cooled™ High Output Twin Cam 103™ Engine and there's no mistaking its roots. This is authentic Harley-Davidson style through and through with an attention to detail you won't find from any other motorcycle company. Black powder-coated cylinders and cylinder heads with machined cooling fin tips are topped off with chrome rocker covers, while chrome pushrods highlight the iconic V-Twin. It's a jewel machined out of metal. Pure. Dripping with power. From the classic edge of the cooling fins to the clean lines of cases and covers—the Twin Cam 103™ engine makes an ironclad statement about holding on to what's right and staying true to what satisfies the rider.